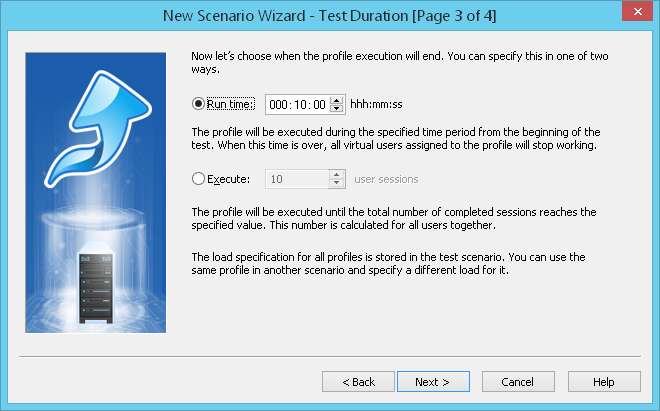 On this page of New Scenario Wizard, you can specify the duration of test run. You can select one of 2 criteria of test completion: either test run time, or the total number of user sessions that should be executed during the test. (Virtual user session is a single pass of user profile.) The test completes when the selected criterion is fulfilled. Run time: Specify test duration (time format is hours : minutes : seconds). Execute _ user sessions: Specify the total number of user sessions that should be executed before the test finishes. You will be able to change the total test duration and duration of each user profile after completion of this wizard in the Test Volume view.